Tribute Tea Company is a boutique tea company based out of Chicago that sources specialty teas from Asia. They initially came to the agency to bring their business idea to life by having us establish branding and packaging for their new company. I worked hard to create something that evoked the look and feel of tea, but that also had a sense of antiquity to it, since, in imperial China, the finest teas were offered as tribute to the Emperor. What resulted was versatile branding that was used on print collateral, packaging, and the website. I wanted to create something that evoked the look and feel of tea, but that also had a sense of antiquity to it. I actually went to a tattoo parlor to look at ancient Chinese dragon illustrations and ornamentation and began working on some initial concepts. The client ended up loving both of the sketches and wanted to see how they would look combined. What resulted was a versatile mark that could be utilized in a variety of colors. The company needed a typeface that looked great on their collateral and packaging, but also needed something that was legible on screen. I chose two typefaces with a bit more character and a look of antiquity for the packaging and collateral. Based on those typefaces, I chose Times New Roman for web, as it's a bit more legible for screens with its high x-height and clean lines. Each tea has its own unique color, so each package was set in a different color that corresponded with its contained tea. Sticker labels were then applied to seal the containers and to mark the name of the tea. Similar to the packaging, I created a set of business cards in three different colorways. 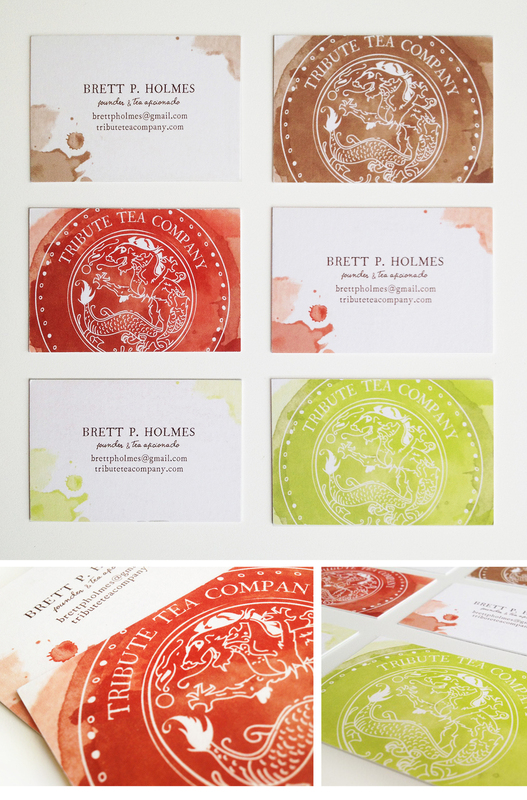 This allowed each business card to feel unique, just like the teas.